For my card I needed two panels. To create these I used the Chirpy Chirp Chirp stamp set by Lawn Fawn. For the front panel I started off stamping three eggs. I also used the grass border stamp and stamped it along the bottom of the panel in light and dark green, overlapping. For the cloud background I masked off the eggs and used a self-made cloud sencil and applied Tumbled Glass distress ink over the edges of the stencil. 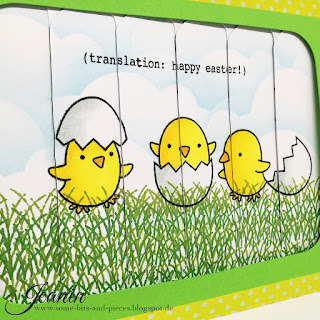 I finished the panel stamping the sentiment "chirpy-chirp-chirp!". 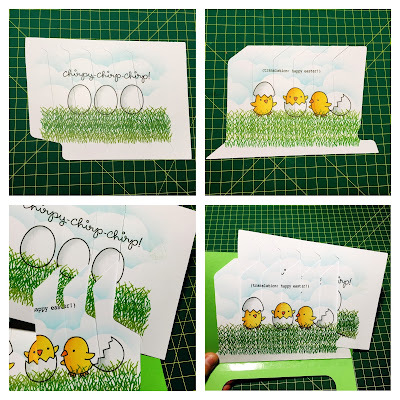 For the second panel I wanted three little chicken being hatched, so I stamped the different chicken and egg shells, masking off specific parts. I also stamped the grass border stamp again and also created the cloudy background to match the front panel. 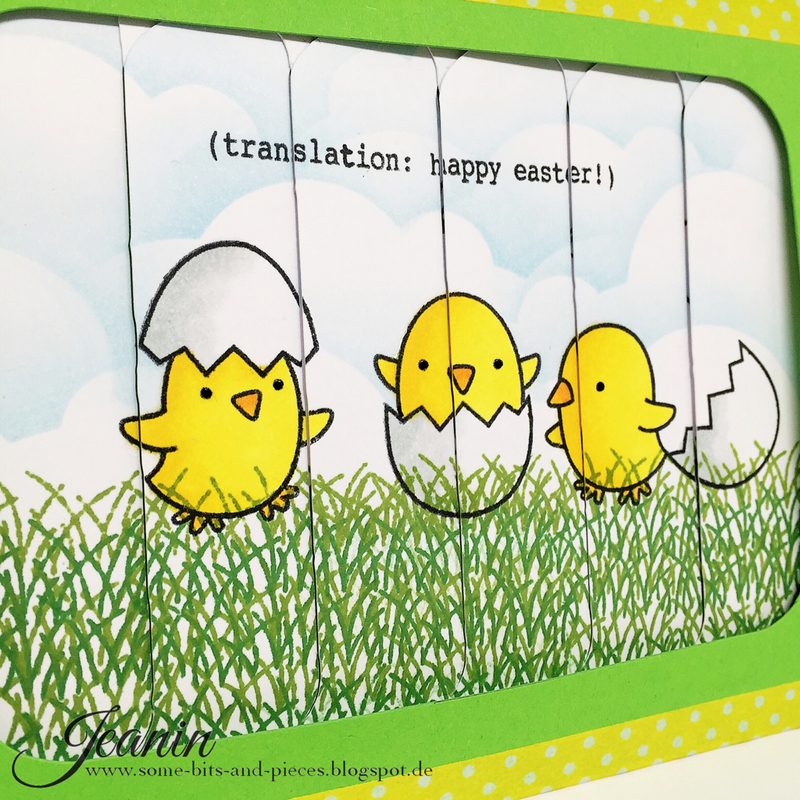 This time, I used the sentiment "[translation: happy easter!]". Now I had to assemble the card. 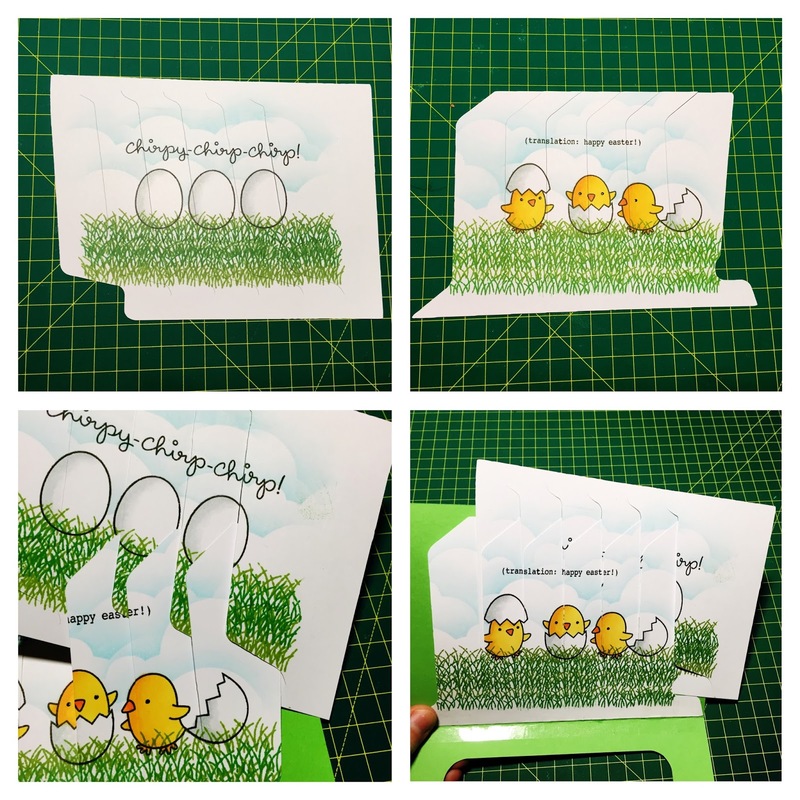 I adhered the back panel to the inside of the card shell that I cut from grass green cardstock. Then I had to threaded the front panel in the back panel and closed the card shell. I also applied yellow washi tape to the bottom and front to make sure that the shell stays shut. You can see the card in action in the video below. I hope you enjoyed my card! 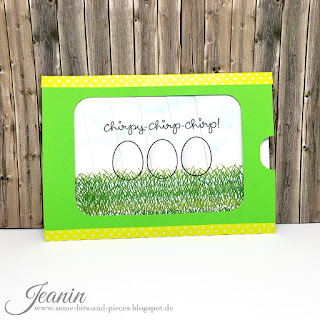 Now hop along and see what Katrin created for you! Happy Easter! F**** me! What a card! Wow, Jeanin, was für ein geniales Design! Du machst immer so tolle und aufwändige Karten. Ich bin ganz hin und weg. Du bis ein echter Plotterprofi. Da kann ich ja fast froh sein, dass dir meine vergleichsweise schlichte Karte so gut gefallen hat. Ach je, stimmt ja, deine Karte ist die verschollene, das hatte ich im Eifer der Hoppens wieder ganz verdrängt. Mensch wie doof! Ich drücke dir ganz fest die Daumen, dass sie noch ankommt. oh man, es sit eine SCHANDE dass die Karte (noch) nicht angekommen ist.. und ich wünsch mir so doll mal ein ganzens Tutorialvideo mit der Anleitung :-) Und wie toll dass die Motive miteinander so Sinn machen :-) Erst die Eier, dann die geschlüpften Küken. ach Jeanin, du bist echt die Interactive-Ober-Knallerin!! !